How do we challenge our pupils academically? At Winchester College, academic expectations are high, and success is achieved through a genuine curiosity and love for learning. A Winchester education therefore combines cultural studies in Div with a conventional curriculum of examined subjects. Examined courses are taught by highly qualified subject specialists. The majority of pupils complete a minimum of nine GCSEs and IGCSEs (all graded 9-1). In addition to Div, pupils begin at Winchester in Year 9 studying Mathematics, Biology, Chemistry, Physics, French or German, Geography and Latin. They also study one of the following: Ancient Greek, Spanish, Russian or Chinese, and choose two subjects from Art, Design and Music. Towards the end of Year 9, pupils express their preferences for GCSE study. The compulsory subjects (in addition to Div) are English, Mathematics, Latin, French or German, and two or three Sciences. Pupils also choose from among the following to bring the total to nine: History, Geography, Ancient Greek, Art, Design, Music, Spanish, Russian and Chinese. Pupils in our sixth form ordinarily study three Cambridge Pre-U subjects alongside Div. Pre-U offers a rigorous academic qualification and an excellent preparation for university study. It provides both learners and teachers with a great deal of flexibility, and speaks well to the educational philosophy embodied in Div. There is generally less prescription than at A-level, and the Pre-U is very good at training soon-to-be undergraduates by fostering the development of student responsibility and independence. Assessment provides differentiation at the highest level. 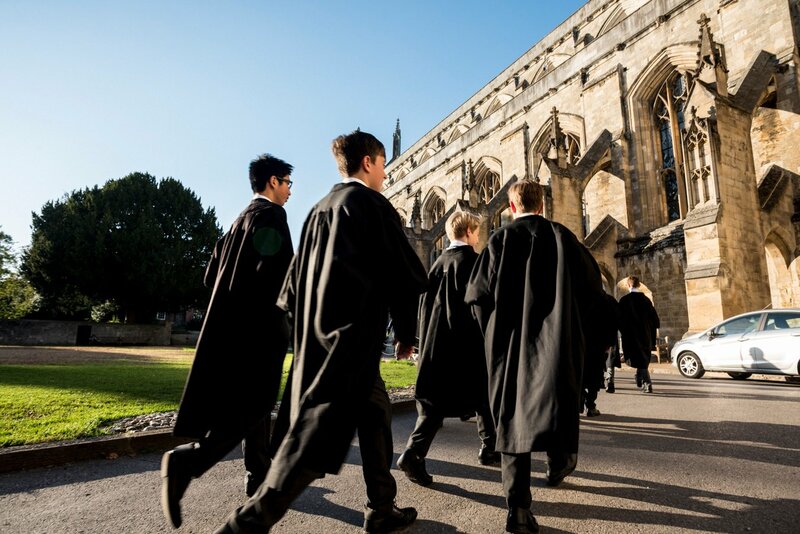 Winchester's matriculation results are annually rated. Mathematics, Physics and Chemistry Olympiad programmes, in which we have a distinguished history of representatives on national teams. Pupils regularly achieve a very high number of gold, silver and bronze medals. In Modern Languages, our pupils compete annually both in the UK Linguistics Olympiad, and in the European Commission’s Juvenes Translatores competition, for which Winchester has produced two winners in the last four years against opposition from some 80 UK schools. The school’s full calendar of society meetings, in which intellectuals and public figures come to Winchester to share their knowledge and interests with the boys. Studium is an annual day for 40+ distinguished speakers to come and talk to us on a wide range of topics. The Winchester Symposium programme, a series of Sunday study days held throughout the year, when other schools are invited to join Winchester pupils to hear lectures from university teachers and to engage in symposium discussions. All dons in the department are practising, exhibited artists. We have talks from visiting experts, an artist-in-residence each year and a regular exhibition programme, which pupils have recently started to curate. Class sizes are small, allowing for a flexible curriculum that is shaped to individual progress. We often use the school’s landscapes, architecture and collections for projects. Inspiration from other subjects, particularly Div, regularly informs lessons and takes us on unexpected tangents. The extensive facilities in Art School allow pupils to specialise in printmaking, sculpture, painting, drawing or ceramics. Pupils go on to prestigious Art Schools such as St Martin’s, The Ruskin Oxford and to Cambridge to read Architecture. Full boarding brings unrivalled access to Art School, so that when pupils become invested in the subject they can be as ambitious and productive as possible during their time here. Art History is a research-based subject. It teaches pupils to formulate their own questions in front of a work of art, and to seek the answers independently. Pupils learn to identify imaginatively with distant cultures. They also learn the danger of making assumptions before acquiring knowledge and understanding. Art History requires pupils to look carefully, to think cautiously, and to write with precision. We are fortunate to have superb works of art to study here on campus and nearby at Winchester Cathedral. In addition to the school’s fine medieval buildings, the art collections include Ancient Greek and Chinese ceramics, medieval sculpture and stained glass, illuminated manuscripts, casts of Renaissance sculpture, English watercolours and 20th century artists’ books. Many Old Wykehamists, such as Stephen Bann, Tim Wilson, Christopher Rowell and Guy Peppiatt, have gone on to become prominent in the art world. Biology provides a vital grounding in how living processes work as part of a functioning world. The dons use prior experience in agriculture and fisheries and game management to make the learning as pertinent as possible. Boys also conduct ecology practical work in the school grounds, including the biodiverse River Itchen, and the adjacent National Park, whenever possible. Pupils are frequently stretched and challenged with material beyond the curriculum, which provides strong preparation for university. Biology students become skilled at lateral thinking, problem solving and possess academic resilience. Many go on to become doctors, vets, and research scientists in the biological sciences. Promising biologists become keen advocates of our Natural History Society. With the emphasis on practical work, pupils undertake at least one experimental activity per week. Each chemistry lab contains at least six fume cupboards, allowing paired practical work on organic synthesis. The instrument suite has an FT-IR spectrometer, ultraviolet-visible spectrometers and a gel chromatograph. These instruments are used by pupils in lesson time and for voluntary project work. Dons seek to provide extra opportunities for pupils of all abilities and ages. We are particularly successful in national competitions such as the Cambridge Chemistry Challenge for Sixth Form pupils, and the UK and International Chemistry Olympiads. Pupils benefit from the various Scientific Clubs and Societies on offer. Pupils can choose to learn Chinese from their first or even second year, for five to eight terms. We bring them to the level of an A*/A grade in that short period of time. Beginning with the basics of Mandarin Chinese, we motivate pupils so that they drive themselves forward, without pressure from the dons. Though the teaching and homework hours are mainly allocated to mastering linguistic technicalities, we try as much as possible to bring cultural, historical, and current affairs to the fore. Our pupils have also gained much from our exchange programme with a school in Shanghai. Those learning the language also enjoy hearing from the Oriental Society’s guest speakers. Classics is the foundation of much of Western ideology, culture and language. Winchester has a centuries-strong reputation for this subject, now reinforced by an appropriately contemporary approach. The focus is unashamedly linguistic: Latin is compulsory up to GCSE and Ancient Greek is also studied. A close reading of ancient texts teaches pupils how to think critically about sources, enhancing skills in analysis and evaluation. Classics is not just the study of linguistics, but also of archaeology, history, politics, law, art and architecture. Pupils have the opportunity to study Greek art in the school’s Treasury, handling 2,500 year-old vases and curating their own exhibitions. Keen Classicists enjoy the school’s Historical Clubs and Societies. Each member of the Design and Technology department comes from a different design or engineering background. Regular visits to museums, engineering firms, as well as large and small factories, inspire individual projects within the curriculum. Learning is tailored to a pupil’s own interests and provides the freedom to explore ideas to fruition. DT teaches life skills. Pupils are allowed to make mistakes in a controlled environment, overcoming issues independently and understanding how to avoid problems in the future. They are encouraged to avoid thinking in a linear fashion, but to evaluate, make decisions and understand people - ultimately, clients - from whom pupils also receive external briefs. Talented students have gone on to enjoy careers as architects, designers and entrepreneurs; some have read Nuclear Science and Engineering at MIT. Our various Enterprising Clubs and Societies are available to all pupils. Learning to improve the standard of living for ourselves and future generations is in keeping with the school’s philosophy of leadership to serve society. Pupils listen to their peers with respect and accept differences of opinion, quickly learning to compromise with opposing views. Together with an expectation of independent learning, these class discussions are solid preparation for a university education. Economics can be for anyone, though an aptitude for Maths helps. It is more important to be interested in constructing arguments and counter-arguments, and in current affairs. The department’s own resources, used for much of the course, are kept as up-to-date and relevant as possible. Economics instils a broad range of highly transferable skills, from learning to read data effectively, to avoiding ‘fake news’, to constructing a coherent argument based on potentially conflicting pieces of evidence. Talented economists appreciate the many Oratorical Clubs and Societies we offer. Perhaps paradoxically, English often teaches pupils about other cultures. We view having understanding and empathy for others as crucial, as is respecting our heritage. Knowing also that writers can change future society, Winchester provides leadership skills for a life in service to the wider world. Acquiring excellent communication skills is therefore a vital component of a Winchester education. Discussion takes a central and highly anticipated role in every lesson. Dons are allowed the freedom to inspire their pupils with books that will resonate, not merely because they are on a syllabus - using texts that are not ‘set’, but ‘chosen’. Amongst the alumni are published novelists, editors, a film director, and a poet. Students find fellowship in our Literary Societies and in producing school publications. With a 13-strong department of native and non-native speakers, pupils are unlikely to be taught by the same don in two consecutive years. These differing approaches and areas of expertise ensure the pupils’ continuing enthusiasm in the subject. We push the top linguists and support the beginners, while increasing open-mindedness and knowledge of different cultures. In addition to French being a great asset for many areas of the employment market, our course is designed to enhance critical skills in presentation and essay-writing. It also expands cultural knowledge of literature, cinema, drama, and history. High-achieving pupils have gone to French and Swiss universities, and we regularly send students to Oxford and Cambridge. Two boys have recently won the EU Translation Prize, Juvenes Translatores, whilst still at school. Francophiles can also improve their fluency at our French Orpheus Glee Society. We teach highly-focused lessons to get through the prescribed syllabus quickly. This then allows time to set extension reading tasks. Often these relate to current events or first-hand experience of the dons, such as farming, climate change and human migration. There is time too for the pupils to develop their natural curiosity via individual research, presenting their findings to the class and honing their verbal communication skills. A tacit respect between pupils and dons enables discussion that is relaxed and forthcoming. Geography students become socially, environmentally, economically and politically aware, quickly seeing themselves as global citizens. Outside the classroom, we provide many opportunities to learn, with trips to observe post-glacial landscapes, fluvial geomorphology and microclimates, as well as paddle boarding in salt marshes and kayaking round the Jurassic Coast. Practical humanitarianism continues in our many Vocational, Globally Cultural and Outdoors Clubs and Societies. The study of German at Winchester is more than merely acquiring another language: it is the study of culture. Pupils explore a literary range that enhances and deepens their appreciation of Western culture and the arts. Yet the approach to language acquisition remains rigorous. By deconstructing German didactically, we strengthen language skills and achieve a level of learning beyond what is expected. German is the most sought-after foreign language by UK employers, according to the CBI. Yet it is also a living language. Pupils enjoy adopting its idiosyncrasies and using them in and outside the classroom. Combining humour with hard work inspires the swift progress pupils make from first learning the language into their final year. Talented linguists gain much from joining our German Play Reading Society. During the first three years the study of History is combined with the other subjects in Div, and is thus studied by all pupils to Year 11, when it can also be taken as a GCSE. The curriculum ranges broadly. Pupils can expect to study aspects of the past from Classical Antiquity to the present day. The focus is on making lessons interesting and stimulating, allowing pupils to go beyond surface level discussion, and to engage in real depth with complex historical problems. In Years 12 and 13, the Pre-U course allows dons the freedom to teach to their academic strengths and emphasises breadth as well as depth of learning. Outline papers in European and British history are designed to encourage a broad understanding of significant chronological periods, while the Special Subject and Personal Investigation allow boys the opportunity to study specific topics in greater detail, with a focus on the use of primary sources. We offer three discrete periods, so boys may choose to specialise in one of either the Medieval, Early Modern or Modern periods. A wealth of artefacts to study and handle is available in the Archives, Fellows' Library and Treasury. The Maths department writes much of its own material. The emphasis is on dialogue between the class and its teacher. This approach enables pupils to think critically and to challenge assumptions – many of our students go on to distinguished careers in the academic world and the Civil Service, as well as enjoying success in the City. Results at Pre-U are outstanding: half of the school’s D1s (equivalent to a grade above A* at A-level) are in Maths. Our various mathematical clubs prove popular, year on year. In addition to an extensive extra-curricular programme, music can be studied as an academic subject from the first year to Pre-U. It is taught by six full-time teachers who have a wide range of specialisms. They enjoy providing original and stimulating materials that challenge pupils’ assumptions about music. Boys have many opportunities to attend performances and become involved in the musical life of the school. The IGCSE syllabus covers a wide range of genres and musical history, including jazz, world music, and the study of some set works from the mainstream classical repertoire, as well as composition and performance. At Pre-U, set sizes usually number six to eight. Pupils regularly go on to read Music at universities, including Oxford and Cambridge, often with choral or organ scholarships. Enthusiastic musicians can choose from over thirty different specialisms for individual lessons. Teachers of Philosophy and Theology seek to be scrupulous in their intention to try not to persuade, convince or indoctrinate. Discussing schools of thought that differ or contradict those held within the department, or classroom, always produces unexpected insights and questions. It is always a privilege to see how human intelligence can grow in wisdom as a pupil invests time, effort and thought. Wykehamists who pursue Philosophy and Theology can follow in the footsteps of – most notably, in recent decades – Professor Michael Dummet, Professor of Logic at Oxford and one of the most important philosophers of the 20th Century. Discussions are allowed to continue at the Theology And Philosophy Society. Understanding how the universe works is explored with an emphasis on the mathematical and the experimental. Frequent practical work culminates in the Personal Investigation, during which pupils conduct a 4-week suite of experiments of their own design. Problem-solving is an essential skill and we encourage boys to participate in the British Physics Olympiad and similar competitions. They regularly return with Gold medals. Every pupil studies Physics in the first year and the vast majority continue to take IGCSE. The linear Pre-U course provides the best available preparation for undergraduate study and each year a number of our boys go on to read Physics, Natural Sciences and especially Engineering at a range of universities. Many students develop a lifelong fascination with astronomy, nurtured in the school’s own Observatory, as well as on trips to the local Planetarium. Pupils want to express themselves in the language so we give them a thorough foundation on which they can build. Many choose to study Russian because they enjoy the intellectual challenge and want to learn more about the history, society and culture of this fascinating country. They relish the opportunity to speak and write elegantly and accurately in Russian, and develop the ability to discuss a wide range of topics, rather than simply parroting phrases. As there are limited published resources, teachers often create their own materials, including a textbook written with pupils in mind. In addition to an interest in the politics and culture, boys are encouraged to engage with a wide range of Russian literature. The school’s Slavonic and Model United Nations Societies provide considerable extension opportunities. Each teacher in the department has a degree not only in the language but also the literature of the Spanish-speaking world, and have all lived extensively overseas. Inventive teaching methods and the variety of ways we introduce, consolidate and practise the necessary grammar and vocabulary are warmly received. A large component of Pre-U Spanish is, essentially, Div in a foreign language – literature, history, grammar, presentation skills, essay-writing skills, art, cinema and theatre. The qualification opens up young minds to a whole wealth of culture only available to those who can speak the language. Translation loses much. Our Hispanic Society gives pupils access to an even wider range of cultural activities, from visits to Art Galleries and the theatre to play readings and visits from specialist speakers.